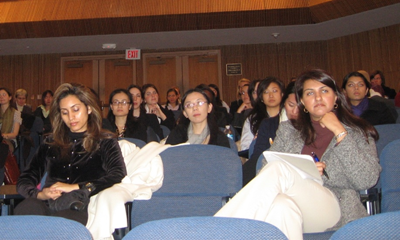 On January 13th, students, faculty, staff and visitors gathered in the Rafik B. Hariri Building’s Lohrfink Auditorium to hear the current voice of women on Wall Street. Representing a variety of ages and experience, representatives from Barclays Capital, Credit Suisse, Deutsche Bank Securities, Inc., Goldman Sachs, JPMorgan, Morgan Stanley Smith Barney and UBS shared their stories of triumphs and tribulations as they negotiated their careers as women in business. 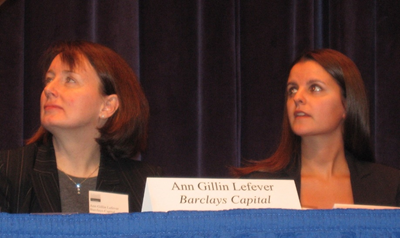 These women addressed everything from interview tips for perspective Wall Street leaders to child care for the audience members who questioned how these women seemed to “have it all.” Following the panel discussion, that incorporated questions from the audience, everyone was invited to a networking reception in the Fisher Colloquium. Georgetown University Women’s Leaderhsip Initiative would like to thank each of the panel participants for their participation in this event. We would also like to thank Dr. Lynn Doran and Georgetown University’s chapter of the Financial Managament Association’s for their collaboration in hosting this hugely successful event.